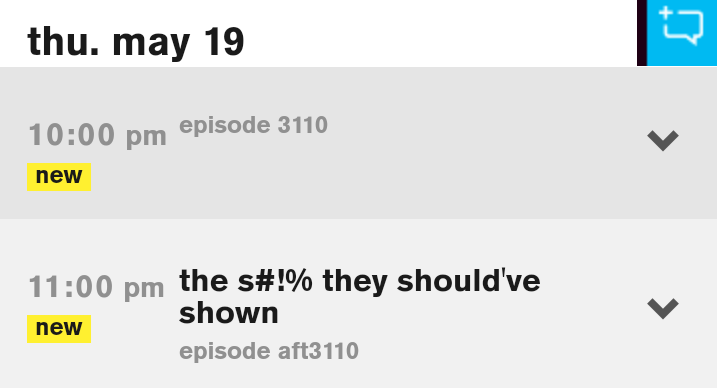 May 19 is episode 10 follow by the **** they should have shown episode.So its not really 2 episodes. If that's the case then Bloodlines, Denver, San Diego 1, Austin, etc are not the epsidoe alloted because the **** they should've shown "Doesn't count" at least according to you. Maybe it is 12 but like I said I doubt they would spoil it /air the special that early if its 12 episodes (with much to be seen). Joi and Jamie ain't **** for me tbh, lool. The **** they should have shown is consider an "afte3110" (aftershow of episode 10). Dylan is 6'5 230. He posted a pic saying that. I remember someone asked this a while back and i forgot if i answered or not. So we're still getting another episode the week after the **** show or is it going straight to the reunion if there even is one. This season truly has been tragic. At this point it honestly better be lit from next week forward. Like the **** show is already the week after this one. What the ****... I had high hopes on this cast and it's just been such a let down in my opinion. PinkRose wrote:Nostalgic wrote:PinkRose wrote:Nostalgic wrote:Season finale May 19thWhere you got that from so only 11th episodes?The **** show is airing after episode 10Two episodes are alledgely airing on May 19th as well according to The Guide. Not totally saying its definitive but I'm still going to go with my original estimate that it'll end May 26th-ishMay 19 is episode 10 follow by the **** they should have shown episode.So its not really 2 episodes.If that's the case then Bloodlines, Denver, San Diego 1, Austin, etc are not the epsidoe alloted because the **** they should've shown "Doesn't count" at least according to you. Maybe it is 12 but like I said I doubt they would spoil it /air the special that early if its 12 episodes (with much to be seen). I did too. vegas 2 was awful as well. they need just ******* avoid it like the plague. Nostalgic wrote:PinkRose wrote:Nostalgic wrote:PinkRose wrote:Nostalgic wrote:Season finale May 19thWhere you got that from so only 11th episodes?The **** show is airing after episode 10Two episodes are alledgely airing on May 19th as well according to The Guide. Not totally saying its definitive but I'm still going to go with my original estimate that it'll end May 26th-ishMay 19 is episode 10 follow by the **** they should have shown episode.So its not really 2 episodes.If that's the case then Bloodlines, Denver, San Diego 1, Austin, etc are not the epsidoe alloted because the **** they should've shown "Doesn't count" at least according to you. Maybe it is 12 but like I said I doubt they would spoil it /air the special that early if its 12 episodes (with much to be seen). I am not wasting my time anymore with you! So bye...Still waiting for the day Bacchuss create an ignore or block button, so I dont have to see your pointless consecutive posts anymore and you dont have to see mines either. So you're mad because I challenged you? You're basically pulling a Mickey. This is an open discussion thread, like chill Rose. Its never that serious. And consecutive? When you asked for that ignore/block button make sure your *** asks for the multiquote function too. Still waiting for the day your *** learns to proofread...I have no problem with you so don't throw unnecesssary shade either. I need me a Rivals pairing with Nostalgic and PR tbh. I need me a life Rivals pairing with Nostalgic and PR tbh. After seeing the episodes so far...I am 100% convice Dylan was added to create a new storylines, since the ones they had were over played and to boring already. They should just have add the other 2 alternates too. hardbitten wrote:I need me a life Rivals pairing with Nostalgic and PR tbh. Every single thing you post is unnecessary but we deal. I saw that **** coming from a mile away. He's on his period. Don't worry about it. I still think he looks like Perry the Platypus with wide distance between his eyes. His face looks just fine imo. I guess to each their own...I find Dione face ugly , while I find Dylan face cuter than dione. I also think Chris has a way cuter face than Dione. I think Dylan looks like Perry the Platypus and Dione resembles Dori from Finding Nemo. WittyWrath wrote:I still think he looks like Perry the Platypus with wide distance between his eyes. I dont see it! other than the long hair lol Zach has an attractive face, dione looks like the gremlin version of him.